Conveyance Tube - SABS 62 has been revised and the 2001 edition no longer makes provision for Light gauge pipes. Due to continued demand, we will continue to offer Light gauge pipe in accordance with SABS 62: 1989 (these pipes are now include din SABS 1182). The tolerance tables are marked with the relevant specification editions to minimize confusion. Galvanised pipe conforms to SABS 62 (1989 and 2001) and SABS EN 10240. The dimensions given are in accordance with SABS 62 (1989 and 2001). Masses shown are approximate. All dimensions and masses are subject to the usual working tolerances. The Specification for SABS 62 is comparable to the following international specifications: DIN 2440, DIN 2441 and BS 1387..
*A = Cross sectional Area of the tube or pipe. 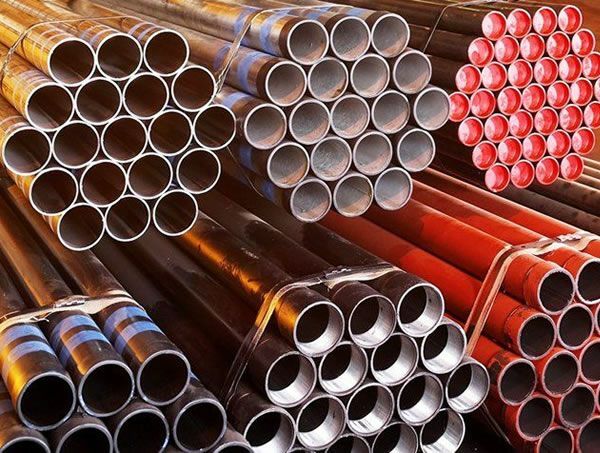 Welded pipes are supplied in standard lengths of 6 metres, in light, medium and heavy grades, Borehole exacts are supplied in lengths of 3 metres. Outside diameter The tolerances for O.D. are shown in the relevant tables for Light, Medium and Heavy pipe. Wall thickness: The wall thickness of Light, Medium and Heavy pipe are shown as minimum values in the relevant tables (the plus tolerance is not limited). Length tolerance: Length tolerances are -0mm +50mm. In the case of borehole exacts, the tolerance on length is -0mm +3mm. Non-Std. Lengths: Can be negotiated. Unless otherwise specified, pipes shall be threaded taper thread. we can supply, to customer preference, pipes that are threaded and coupled or threaded only. Pipes supplied as threaded and coupled will, on each length, be supplied with a socket on one end and a thread protection cap on the other. The ends of the sockets are bevelled sufficiently to prevent damage to the leading thread. Pipes supplied as threaded only, will on each length, be supplied with thread protection caps on both threaded ends. Particular care is exercised in threading pipes. All threading conforms to SABS 1109 - Pipe threads where pressure tight joints are made on the threads. Threads are regularly tested by means of standard gauges. ISO 7 and BS 21 are equivalent to SABS 1109. Galvanised pipes are threaded after galvanising. Threading is not recommended for Light pipes; however, should threading be necessary, standard pipe fitters' dies may be used. The use of parallel threads on Light pipes is not recommended. All conveyance mills have Eddy current testing equipment installed. This equipment examines the integrity of the weld on a continuous basis during production. Additionally all pipes are hydraulically tested to 50 bar (5000 KPa or 5 MPa) for Light pipe to SABS 62: 1989 and to 70 bar (7000 KPa or 7 MPa) for Medium and Heavy pipe to SABS 62:2001 before being passed for despatch. Internal scarfing is available from 40 NB to 150 NB as an added cost option. Pipes 15mm nominal bore and over are available uncoated, coated or galvanised inside and outside in accordance with SABS EN 10240 (minimum galvanised coating thickness 55 microns on the bore). Medium pipe is available in red fireCOTE for the fire protection industry. Heavy pipe can be supplied painted with red oxide. Light pipe - Two Brown Bands. Medium pipe - Two Blue Bands. Heavy pipe - Two Red Bands (alternatively, the whole pipe may be painted red). The colour bands are painted on one end of each length of pipe. All pipes are also hard marked with the ROBOR TUBE logo, the specification number (SABS 62) and a batch code at 1-metre intervals opposite the weld.